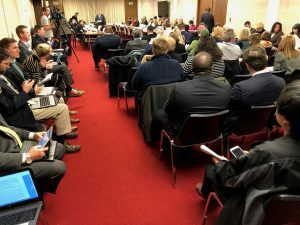 Nov 27, 2018 RALEIGH — The North Carolina State Senate rolled out the governing body’s first public draft of a voter ID bill today that allows college student ID cards and government employee ID cards to be used as voter ID in addition to the usual types of state and federal ID cards. The immediate response from Minority Whip, Sen Terry Van Duyn, was to question the government’s ability to get the law in force for the May 2019 primaries. Committee Chairman, Sen Ralph Hise reminded her that it was now in the state Constitution and there is no provision allowing them to delay it whenever they wanted. The Reasonable Impediment Determination loophole will continue in NC law and no fingerprint will be required of those who find a way to vote without a photo ID. The bill was approved by a voice vote and will now head to the Senate floor. Click here to see the voter ID bill in its first official form.